Today I'd like to tell you about a small but important feature tucked away in Excel 2013 and its previous versions. 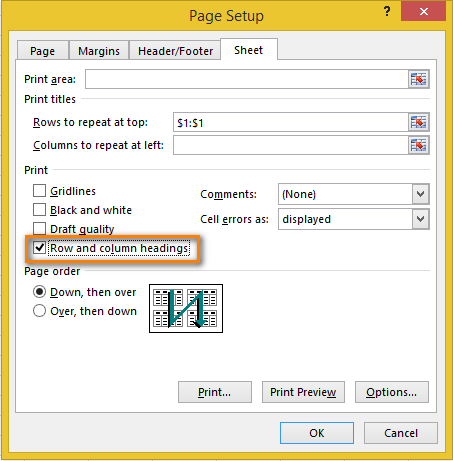 In this article you'll learn how to make header rows and column headers print on each page. If you often have to print large and complex Excel worksheets, I am sure that you face this problem as often as I do. I can easily scroll up and down through the document without losing sight of the column titles because I have the header row frozen. However, when I print the document, the top row is printed only on the first page. If you are sick and tired of turning the printouts back and forth to see what kind of data is in each column or row, feel free to find out the solution to the issue in this article. Your Excel document turns out to be long and you need to print it. You go to the print preview and find out that only the first page has the column titles at the top. Take it easy! 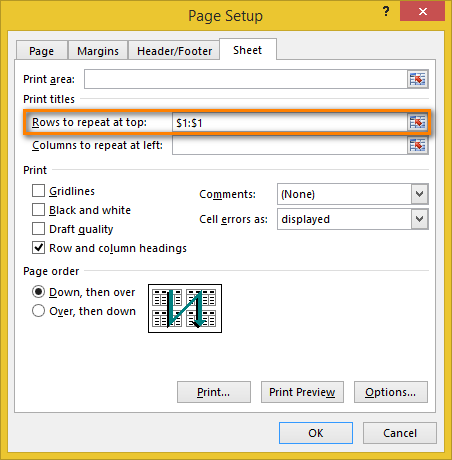 You can specify the Page Setup settings to repeat the top row on every printed page. Open the worksheet that you're going to print. Switch to the PAGE LAYOUT tab. Click on Print Titles in the Page Setup group. Make sure that you're on the Sheet tab of the Page Setup dialog box. Find Rows to repeat at top in the Print titles section. Click the Collapse Dialog icon next to "Rows to repeat at top" field. The Page Setup dialog window is minimized and you get back to the worksheet. You can notice that the cursor changes to the black arrow. It helps to choose an entire row with one click. 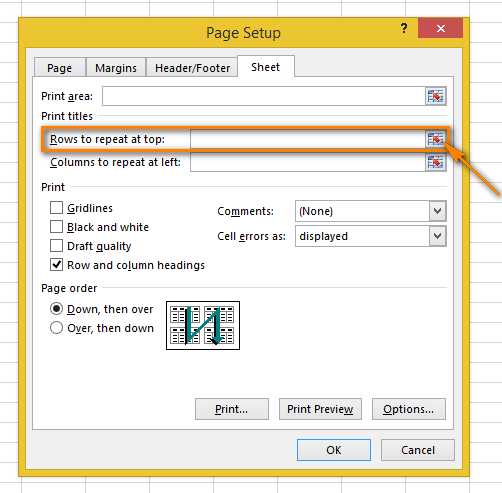 Select a row or several rows that you want to print on every page. Note: To select several rows, click on the first row, press and hold the mouse button and drag to the last row you want to select. Click Enter or the Collapse Dialog button again to return to the Page Setup dialog box. Now your selection displays in the Rows to repeat at top field. Note: You can skip steps 6-8 and enter the range using the keyboard. However, pay attention to the way you enter it - you need to use the absolute reference (with the dollar sign $). For example, if you want to see the first row on every printed page, the reference should look like this: $1:$1. Click on Print Preview to see the result. There you go! Now you know exactly what the columns mean on every page. When your worksheet is too wide, you'll have the header column on the left only on the first printed page. If you want to make your document more readable, follow the steps below to print the column with row titles on the left side of every page. Open the worksheet that you want to print. 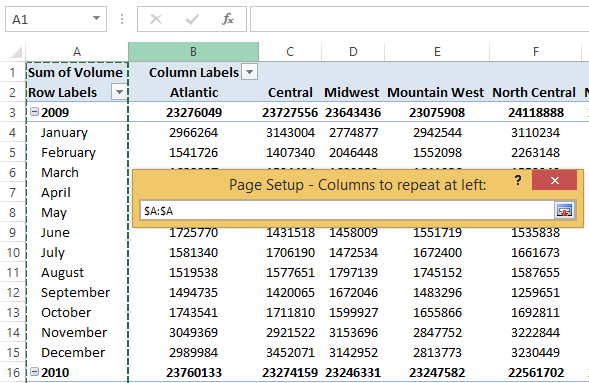 Go through steps 2-4 as described in Repeat Excel header rows on every page. Click the Collapse Dialog button to the right of the Columns to repeat at left box. Pick a column or columns that you want to see on every printed page. Click Enter or the Collapse Dialog button again to check if the selected range is displayed in the Columns to repeat at left field. Press the Print Preview button in the Page Setup dialog box to look at your document before printing. Now you don't have to turn the pages back and forth to find what the values in each row mean. Open the worksheet that you want to print with the row and column headings. Go to the Sheet Options group on the PAGE LAYOUT tab. Check the Print box under Headings. 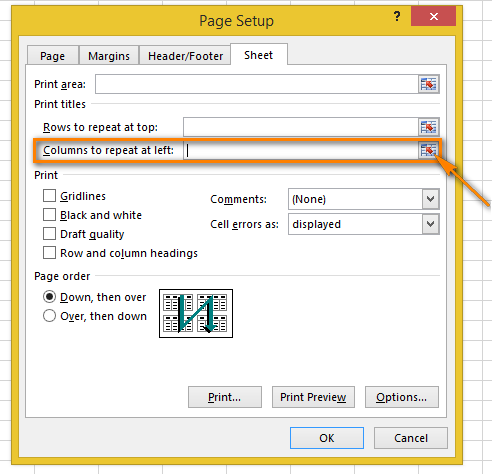 Note: In case you still have the Page Setup window opened on the Sheet tab, just check the Row and column headings box in the Print section. It also makes the row and column headings visible on every printed page. Open the Print Preview pane (FILE -> Print or Ctrl+F2) to check the changes. The Print Titles command can really simplify your life. Having header rows and columns printed on every page allows you to understand the information in the document more easily. You won't lose your way in the printouts if there are row and column titles on each page. Try it out and you can only benefit from it! 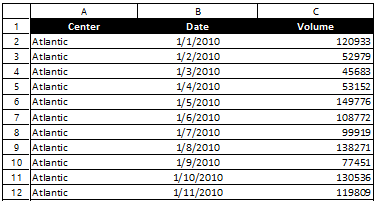 48 Responses to "How to print row and column headers of Excel spreadsheets on every page"
I would like to know if there is a way to repeat row and column titles not on each page, but some selected pages. I am sorry but the only solution I can recommend is to print pages without titles. You need to specify the range to skip. Then print the necessary range with the row and column headers. I've done this on several versions of Excel but in 2013 that optiion is grayed out. The same thing happened to me, but that was when I used Print>Page Setup>Sheet tab. That way the field is greyed out. 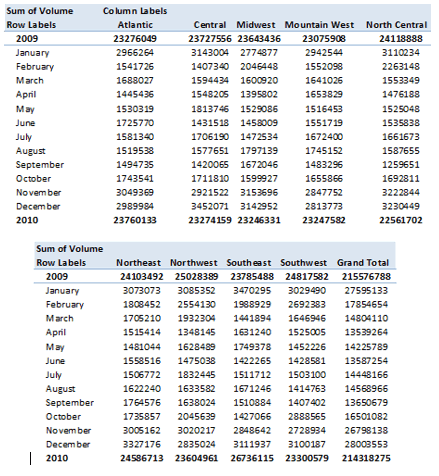 But I tried using Ekaterina's method, using the Page Layout ribbon, that works well on my Excel 2013. Thanks a lot! searched for it a lot of time! I still cannot repeat rows, the the rows to repeat field is greyed out. I'm with stenili. "I still cannot repeat rows, the the rows to repeat field is greyed out". Clicking on the Collapse Dialog icon does nothing. Odd how this worked for me last week in another file. Thanks. Thank you - was just what I wanted. I would like to have the columns repeat on every page break, as I have a years worth of recerts I am trying to input and have to keep going back to original page to see the column I am in. This is the first suggestion that worked. Why is it not possible to have multiple workbooks open and select rows to repeat at the top? Is there a technical reason this happens? Hi everyone. Excel "greys out" or does not let you select rows to repeat if you are in page break preview View. I changed my view to NORMAL and it allowed rows to be selected. I am in Excel 12.3.6. I follow the instructions exactly and lines 1 and 2 that I selected do not end up on each page. Any suggestions? The "greyed out" issue persisted until I only had one Excel file open. Once I closed the other workbooks, my print titles option opened up! Thank you! Closing the other workbooks was key for me! Take the printed document, insert into copy machine Top edge into the feeder, Tell the copy machine that the Left edge is in the feeder, then press Copy. Your headers will now be vertical columns. It's nuts, but really as simple as closing all the other files to get rid of the grey and then set the "Rows to Repeat". yes, i agree. i spent hours doing research online and finally see this post about closing all other workbooks!!! microsoft needs to fix this bug in their programming!! thx for your help. My Rows to repeat at top: is still grayed out. I've done this countless times for me to repeat rows and columns. Now for some reason it's won't work. Any other suggestions? I want repeat a row 2 3 times in same page. How it 's possible. I'd like to repeat information in a single cell (not a row or column; is there a way to do that? Sorry, I meant to ask: I'd like to repeat information in a single cell (not an entire row or column) to show on all pages I want to print within the same worksheet. I didn't have to close any workbooks but closing a page layout menu in another workbook worked. I'm Md. Ikhtiar Rahman, Asst. Account of the Company. My major work is every month salary making with over time, maintain attendance and etc. I work everything fine. But Some are formatting is very difficult (I don't know about that). I know and properly use Header and footer, Heading row repeat with Freeze Panes. ya i have the same problem. havebeen trying to solve for 2 weeks. I found out a code like this but now i need my write to fit the page, not left centre or right footer. Is there another way to do it or how can i compound the footers?? Thanks a lot. StrFtr = StrFtr & c & " "
its really an amazing and useful way to save our time. it really works. thanx a lot for sharing this useful information. Wonderful. Thank you so much for the information. Thanks. It's really useful and helpful. Thanks again. Exactly what I needed - thank you! Very helpful this tunes. thank you. I want to set print headings or title on some specific pages not all page, so any solution i can do this? How to remove the header logo on every page which it is not necessary. Only the first page. How can I solve that issue? I have a problem where the next row is printing as part of the print title but it is not a selected row? Been searching everywhere but can't find where anyone else has had this problem.